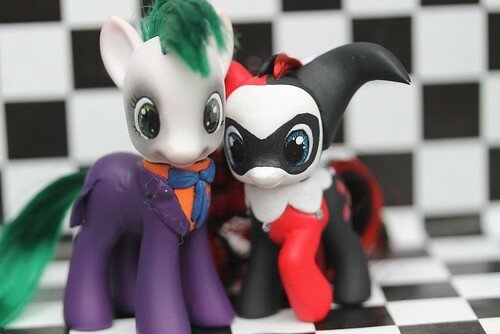 Lately it seems like My Little Pony has become my little addiction and I’ve always loved Joker and Harley Quinn so when I found the two combined, I was powerless to resist. 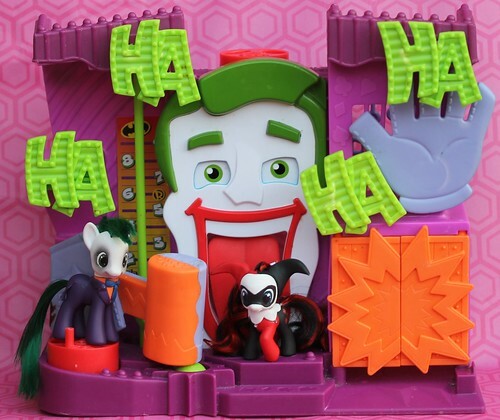 My Little Joker and Harley Quinn were made by Coinoperatedcustoms, they also made a Batman and Robin which is now available on their etsy shop. 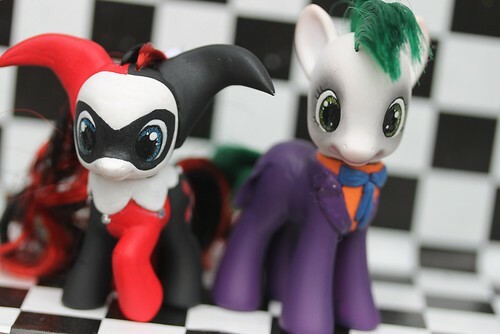 I would have bought them too but sadly I have already exceeded my MLP budget but if they hang around much longer I have a feeling Joker and Harley Quinn will be getting some torture victims playmates. I couldn’t be happier with the pair, they are pony perfection. An unexpected bonus, it turns out that they are just about the right size to make the Imaginext Joker’s Funhouse their new haha hacienda! This entry was posted in Comics, Love that Joker, My Little Pony and tagged dc comics, harley quinn, joker, mlp, my little pony. Bookmark the permalink. OMG! That last picture is sooooo adorable! I’m so glad they made it to you safely, I was so worried about her head popping off or his suit tails breaking (thus the abundance of puffy-stuff packing them). They made it through shipping just fine luckily they didn't have a far distance to travel (I think we are both in New England).